Two Darragh Fanning tries saw Leinster hit back from a nine-point half-time deficit to beat Wasps in their European Rugby Champions Cup match in Dublin. The three-time champions were 20-11 down at the break, Wasps scoring through Alapati Leiua and Christian Wade either side of Farragh's first. Leinster had the wind with them in the second half and cut the deficit as Farragh scored his second. And they took a decisive lead when Dominic Ryan just reached the line. Between them the two sides have been champions of Europe five times, but while Wasps' last win came the best part of a decade ago, Leinster won as recently as 2012. But the Dublin-based side lost Ireland rugby icon Brian O'Driscoll to retirement during the summer and are in the midst of an injury crisis, with international forwards Cian Healy and Sean O'Brien among those on the sidelines. With their two big ball carriers absent they needed Jamie Heaslip to deliver and the captain and number eight was at the heart of a powerful Leinster display as they made the most of the conditions to come storming back in the second half. Coventry-bound Wasps have had to overcome major issues themselves recently and lost captain James Haskell to illness before kick-off, but Andy Goode kicked them into a 6-3 lead before Leiua read Noel Reid's inside pass to perfection and raced clear to score. Leinster replied immediately as Fanning raced onto Gopperth's kick after Heaslip had powered through Joe Launchbury's tackle. But Wasps earned a nine-point interval lead as Wade scored a quite dazzling try, skinning Ian Madigan on the outside and demonstrating scorching pace to sizzle down the line and beat two more men before diving in at the corner. Goode converted both Wasps tries but that was to be as good as it got for the English side. A Madigan penalty just before the break kept the hosts in touch and after half-time there was only one side in it. A heavy shower swept in at the interval but the hosts made light of the greasy conditions and Farragh soon finished off a sweeping move, with Madigan's conversion cutting the gap to only two points. The decisive score came immediately after the hour mark, with Ryan powering his way to the line and just reaching the whitewash at full stretch to finish off a pulsating attack. 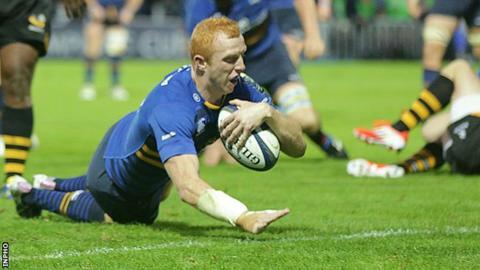 Madigan converted and Leinster had an advantage they maintained until full-time. Wasps boss Dai Young: "In fairness, we knew obviously going into half-time we hadn't done enough to sit back and think we had done enough to win that game. "We weren't quite accurate enough in the first 10-15 minutes of the second half and ended up giving Leinster the ball and once they gained momentum, it's very difficult to turn that momentum back in your favour and we ended up defending pretty much for the last 30 minutes of that second half. "There is a lot of rugby to be played - it is important we get a win next week [against Harlequins], that is the important thing for us to focus on." Leinster: Madigan; Kirchner, D'Arcy, Reid, Fanning; Gopperth, Reddan; J McGrath, Cronin, Bent, M. McCarthy, Toner, Ruddock, Ryan, Heaslip. Replacements: Boss for Reddan (62), Strauss for Cronin (65), Furlong for Bent (65), Douglas for M McCarthy (48). Not used: E Byrne, Conan, M McGrath, Fitzgerald. Wasps: Masi; Wade, Daly, Leiua, Tagicakibau; Goode, Simpson; Mullan, Festuccia, Cittadini, Launchbury, B Davies, Johnson, Thompson, Hughes. Replacements: Miller for Masi (30), C Bell for Goode (64), McIntyre for Mullan (72), Lindsay for Festuccia (76), Cooper-Woolley for Cittadini (62), Gaskell for B Davies (64), Jones for Thompson (41).